Personal preference often is a deciding factor when selecting mulches. I personally prefer a river rock for general “permanent” foundation landscaping because of the semi-formal appearance and permanence, shredded hardwood for shrub and perennial gardens for a more casual look and is somewhat removable, and straw for the vegetable gardens only because it is very easily moved and adds nutrients to the soil as it decomposes. But for each application of mulch, we should think through the pros and cons of the vast variety of mulch available. Not all of the above will be a necessity for every mulch application, and some will be more important to others. The important thing is to consider what is most important to accomplish in each situation and what is not necessary at all. Then you can consider the pros and cons of each type of mulch. Protect soil and roots when establishing new planting areas. Plants will do best if they are not competing with grass or weeds for water and nutrients. Create a mow and trim free zone around trunks and stems, and over root zones, to prevent damage. Now you are ready to consider the pros and cons of a variety of traditional mulches, or perhaps some that are less traditional. 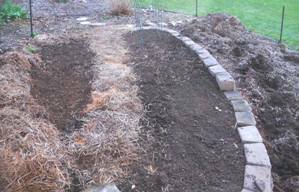 We’ll start with the inexpensive and readily available organic mulches. Dry fallen leaves should be coarsely shredded with a lawn mower or shredder vac. Whole leaves can blow away and finely shredded leaves can prevent water and air from penetrating. Apply at least a 2 to 3 inch layer to inhibit weed growth and keep the soil moist and cool. Contrary to common belief, oak leaves or pine needles will not change the pH of your soil to any measurable degree. Leaves decompose fairly quickly and will need to be refreshed every year or two, or they can be worked into the soil of annual and perennial gardens. As they decompose, nutrients are added to the soil. Worm and insect activity is encouraged, aerating and conditioning the soil underneath. Leaf mold should not be used as a mulch as it tends to form an impenetrable crust, save it for your compost or use as a soil amendment. Whole or shredded leaves are excellent for winter mulch. Good choice for annual and perennial gardens or naturalized woodland gardens. Clippings should not be collected for use after being treated with herbicides to prevent damage to plants, wait at least three mowings. Allow clippings to dry completely, then apply a 2 inch layer to control weeds (if your clippings are full of weed seeds they will sprout). Fresh green clippings in a deep layer will become matted, preventing air and water from penetrating. Grass clippings decompose very quickly, adding nutrients to the soil and encouraging activity that will aerate and condition your soil. Used in annual, perennial, and vegetable gardens, the clippings can be worked into the soil rather than removed for planting, tilling or adding compost. Be sure you are getting straw, not hay which is full of weed seeds (decorative bales widely available in autumn are usually hay). A thick layer of straw will control weeds, if it is chopped you wont need to apply it as heavily. But it does decompose very quickly. This makes it ideal for vegetable gardens, where it will improve the soil as it decays, and can be worked into the soil at the end of the growing season. Air and water easily penetrate. Straw is easily moved and replaced for planting, tilling and adding compost to the soil. Straw is an excellent mulch to keep the soil cool in the summer and to maintain consistent soil temperature in the winter. As the straw is hollow, additional dead air space is created - a great indicator of good insulation properties. Although pine needles are excellent for mulching, fallen needles should never be removed from under pine trees. They are essential to providing nutrients to the tree. Many use pine needles on the theory that they are great for acid loving plants, but they do NOT make any measurable difference in the soil pH. Wood chips do a good job of keeping the soil cool and moist, allow air and moisture to penetrate, providing weed control, and help moderate the soil temperatures in winter. They do not break down quickly, but will likely need some refreshing every few years to maintain a 2 to 3 inch depth. Wood chips do not improve soil and should not be dug into the soil unless composted first. Nitrogen that the plants need is used from the soil to decompose the wood. Wood chips lying on the soil surface are decomposing too slowly to sap nitrogen from the soil. Wood chips are a good choice for permanent and semi-permanent planting areas such as perennial gardens and shrub borders, with a pleasing natural look. If carpenter ants or termites are a problem in your area, do not use for foundation plantings adjoining your home. Any wood material may attract them. Because it is thin shreds of wood, shredded hardwood is very good for suppressing weeds and will hold in place in heavy rain unless on a steep slope. Hardwoods also decompose quite slowly, compensating for the smaller shreds that would decompose rapidly in a softwood. It will need to be refreshed every few years to maintain a 2 to 3 inch depth. A shredded bark on the other hand will decompose very quickly, requiring annual renewal. Like wood chips, do not dig into the soil. Shredded hardwoods do a good job of keeping the soil cool and moist, allow air and moisture to penetrate, and help moderate the soil temperature in winter. Shredded hardwoods are a good choice for perennial and shrub borders, and other permanent or semi-permanent plantings. Like wood chips, should not be used as a foundation planting mulch if carpenter ants and termites are a problem in your area. Although finished compost should not be considered a mulch but rather a soil amendment, if you have partially finished compost it can provide an excellent but short term mulch. It will finish decomposing fairly quickly and add nutrients to your soil through the growing season. It can be dug into the soil rather than removed when new plantings are added. A good choice for vegetable gardens, annual and perennial gardens. Although man made, newspaper is a natural product of trees and printed with vegetable inks. Layers of newspaper have long been used by gardeners for all sorts of mulching applications. Newspaper does everything a mulch is supposed to do as well as decomposes to condition the soil. I do not believe their is much in the way of nutrients added to the soil, but if fully decomposed and worked into the soil it will improve texture, lighten heavy soils, and encourage beneficial insect activity. Newspaper is frequently used alone in vegetable gardens to reduce soil splash, keep soil moist and cool once heat sets in, and control weeds. But newspaper is also great for establishing new planting beds. If the soil does not need to be amended first, for example to plant some of the tough native perennials, simply lay thick layers around the plants. Most gardeners add either more soil over the top or a decorative mulch such as wood chips or shredded hardwood. I have used newspaper under hardwood mulch as an added weed barrier when waiting for large planting areas of pine trees to establish. It is an inexpensive alternative to landscape fabric and does a better job allowing water to penetrate. It does break down fairly quickly on its own, but lasts longer with wood mulch on top. This was kind of a big trend for a while. It is an organic mulch with a wonderful aroma, but extremely expensive, especially if it all blows away in high winds. If the hulls are too fine they may prevent air and water penetration. And they may develop a harmless, powdery, white mold. Since cocoa bean hulls do a nice job of keeping soil cool and moist, prevents soil splash and adds organic matter to the soil, you may want to consider using these rich brown, aromatic hulls in a small area of a sitting garden or an entry, or perhaps in container gardens. Be prepared to replace or refresh it every year. I love the idea of using plants as a mulch. A lot of us do this without really even thinking about it. Planting moss between stepping stones is a great example, hosta in a shady area, or creeping thyme on a hill. These plants hold the soil, keep it cool and moist, and don’t demand much of the soil. They hold on to leaves and debris in the fall to help keep soil temperatures more consistent. And they are permanent. Do keep in mind when planting ground covers, that the space between new plantings are quite likely to develop weeds. Use a fine shredded mulch or pea gravel between the plants until they establish and spread. Ground cover perennials or evergreens are also a nice addition to foundation plantings instead of traditional rock mulch. Inorganic mulches are either man made or stone, and do not break down or break down over a period of many years. These virtually permanent mulches are ideal for permanent planting areas. Do remember however, that shrubs do not live forever. Ten years from now you may be removing your “permanent mulch” to replace a dead plant. But, at least it should only be every 10 or 15 years if you’re lucky. These materials are not generally used anymore for foundation plantings. More commonly now, they may be used to create recreational areas such as play areas or surrounding fire pits, as well as commercial applications. They are also an ideal medium for creating foot paths or even for lawn or recreational equipment. They are permanent materials and difficult to remove if you need to. A 1 to 2 inch layer will control weeds fairly well, and they can be applied over plastic or landscape fabric for added control, but the added barrier will inhibit air and water flow. This would not be a problem in recreational areas. Rock can absorb and retain heat, so it can make a sunny area quite warm. They also get cold when temperature drops, and they do little to protect roots or prevent soil heaving. Another reason not to consider small stone mulch for perennial garden areas. There is great variety of rock available for landscaping and foundation plantings. On their own, these larger rocks need a pretty thick layer to provide a good weed barrier. Depending on the stone size you will need anywhere from 2 to 4 inches. It is heavy and expensive to install, and somewhat difficult to remove if you need to replace a planting. But most of the landscape rock are pretty permanent, they are going to be around for a very long time. I have found however, that some rock seems to deteriorate fairly quickly. In 5 to 10 years a fine rocky sand develops among the stones, providing enough for weeds to grow. I prefer the hard, smooth river rock to eliminate that problem. Like the small rock mulches, little protection is provided for roots or maintaining soil temperatures. When used for hardy foundation plants and around trees, this should not be a problem. Many gardeners, landscapers and do it your selfers also use a black plastic or landscape fabric under the rock. This will aid in weed control. But I am not fond of the heavy black plastic. Although black plastic is an excellent weed barrier, water and air do not pass through at all. Water will not reach plant roots when it is needed, and in wet periods the soil will be kept very soggy since air cannot circulate. Landscape fabric is better for your plants. Used alone, without decorative mulch overlaid, I find all of these extremely unappealing and harmful to plants, with several disadvantages. The black fabric and black plastic heats up the soil which is not good for your plants in general. The plastics do not allow the soil to breath or allow moisture to pass through. The clear plastic does not prevent weeds from sprouting underneath and eventually pushing through the plastic. When exposed to sunlight these materials all break down fairly quickly. There are specific, short term applications for black plastic and fabric in gardens, but that is another subject entirely. Although a newer mulch material with not enough research and evaluation yet, I like the idea. It should provide many of the things we want in a permanent mulch, allowing air and moisture to pass through, provide weed control, and at least as much protection in winter as rock. It is also an excellent use for old rubber tires. The appearance is getting better, some I have seen is actually quite attractive. Unfortunately, at least for now, it is quite expensive so I have not tried it. I have a very large area of trees and evergreens that I refresh every few years with hardwood mulch, the one time expense of rubber mulch nuggets might be worthwhile.